Introducing Cellular SMS/Text to Speech Amplifier for Audio Security Alerts and Voice Mass Notification - TextSpeak Notify! ISC West, Las Vegas USA – April 05th 2016 – TextSpeak today introduced CE, the industry’s first cellular enabled text to speech amplifier. 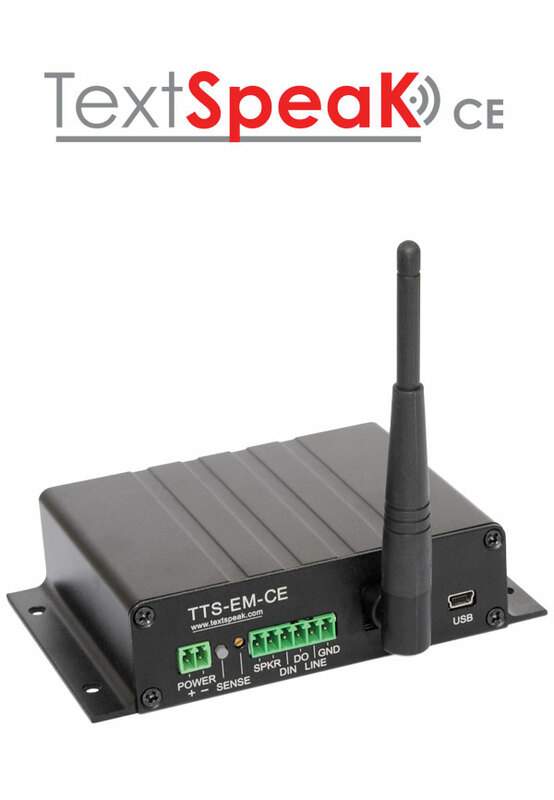 This new addition to the TextSpeak Device Amplifier family transfers SMS emergency cellular text messages directly to endpoint speakers and paging systems. Simply send an SMS message to the pre-assigned telephone number and the TextSpeak CE amplifier speaks the text. The system supports 25 languages and instantly converts text and data to a high definition, natural sounding voice. For the first time, wide-area mass notifcations can reach beyond registered mobile phones. A single CE amplifier can announce a standard text message, sent from anywhere, directly to a paging system. The amplifier can also resend texted data to another network and/or display the announcement on an overhead LED message sign. User definable security levels ensure that only messages from authorized personnel, automated systems and/or emergency responders may generate announcements. To enhance the user experience, TextSpeak offers factory setup with service by Verizon Wireless™. When optionally purchased, the TTS-EN-C ships with a US phone number pre-assigned on a low cost monthly plan. Service subscription required. Our new technology is applicable in any area requiring emergency announcements, including campuses, health care institutions, government and private facilities, and mass transit hubs. A single TextSpeak CE can now offer Mass Notification capabilities to a corporation or institution that is in need, but is restricted by budgeting and cost concerns. This has the potential to greatly improve the availability and effectiveness of emergency and security mass communications.